As the second most polluting industry, the textile sector is responsible for a large portion of the world’s CO2 emissions and industrial waste, not to mention the exploitation of “indecent” working conditions. At the same time, the industry has a complex value chain, with production facilities located all over the world, which makes it very hard to gain accurate information about sources and relevant environmental, health, and social risks and impacts. Large brands have started to embrace sustainability, but the majority of manufacturers and suppliers have not. In order to increase the industry’s ability to manage its value chain more sustainably, both consumers and businesses must first be aware of the nature and magnitude of the issues. Improving transparency and traceability has therefore become a priority. The United Nations Economic Commission for Europe (UNECE), together with experts from governments, private sector, academia, international governmental and non-governmental organizations (NGOs) has looked into such risks and impacts and produced a study. 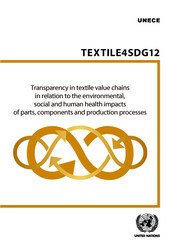 The study identifies possible solutions, and provides recommendations for an international framework initiative on transparency and traceability for sustainability patterns in the clothing sector, in support of Sustainable Development Goal 12 on responsible production and consumption.